Played Kath Cartwright on Emmerdale from September 2017. Playing Mary, mother to Iris Evans played by Suki Waterhouse in Jamie Adams’ Bittersweet Symphony which is currently in post production. Claire was delighted to work alongside the iconic Jennifer Grey in this improvised feature film. Starred as Anne in the short film Sketch which won Best Short at British Independent Film Festival in August 2018. Directed by the brilliant Peter Lee Scott. Played Anne in Moon Dogs which was incredibly successful in film festivals across the globe. Directed by award winning Philip John. In 2018, Claire has also turned her hand to directing and has completed two short films, Sherlock Jones which won the People’s Choice award at the It’s My Shout Awards in Cardiff, September, 2018 and was aired on BBC Two Wales, and subsequently on iPlayer. And Between, written by Neil Bebber, starring Dave Maybrick and Judah Cousin. She has several short films and a feature film in development with a view to continuing her directing work. Played Karen in Blast Theory’s new work developed in partnership with National Theatre Wales. The app can be downloaded from your app store by searching for “Karen from Blast Theory”. For more details go here. Played Karen in Matthew Trevannion’s new play “Leviathan’ performing at Oran Mor, Traverse, and Sherman Cardiff. DIrected by Sherman Artistic Director Rachel O’Riordan. See Press page for reviews. Filmed Doctors on BBC1 as Dr Judy Williams which was transmitted on 22nd January 2015. Appeared as Ms Jones, Defense Barrister in Peter Barlow’s Trial on Coronation Street in mid October 2014. Claire recently enjoyed working alongside Craig Roberts again in his directorial debut, Just Jim, where she had a cameo of the “Waitress”. Played Sophie in Waterloo Road. Filmed in late July 2014. Filmed the part of Mrs Davis in Moving on with Steffan Rhodri for It’s My Shout Productions in late August. “The Golden Record” by Duncan Macmillan and Effie Woods directed by Polly Thomas. Transmission Wednesday 8th October 14.15 R4. 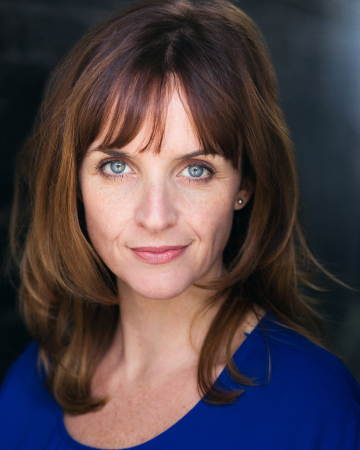 Claire Cage has worked in a wide variety of roles in TV and Radio since leaving Aberystwyth University in 1993. TV appearances include Wizards versus Aliens, Coronation Street, Wire in the Blood, Mistresses, Torchwood, Sherlock, A Royal Wedding, Tracey Beaker, Life Bites for Disney Channel UK, The Fabulous Baker Boys, and Patsy Zimmer in Being Human. Claire appeared as semi-regular Natalie Fletcher on Casualty, wife of “Fletch” played by Alex Walkinshaw. She worked with Richard Ayoade on his smash hit indie directorial debut, Submarine starring Craig Roberts. She played Sister Edith in the short film Little Munchkin and went on to play Lottie Jenkins in Elfie Hopkins with Ray and Jamie Winstone, both directed by Ryan Andrews. Theatre credits include An Enemy for the People by Gary Owen, Wanted (Cwmni 3D) and co–writing the popular theatre show Fraser Sefton. She is also a founder member of Be:spoken Theatre with whom she played Pauline in A Kind of Alaska. She played Ladder in Lurking Truth’s production of I Saw Myself by Howard Barker and most recently the part of Joan in Sexual Perversity in Chicago with Living Pictures Productions. She is represented by Felix de Wolfe, 2nd Floor, 20 Old Compton Street, London, W1D 4TW. All enquiries and autograph requests can be sent there. For regular updates see her CV page. Thanks.